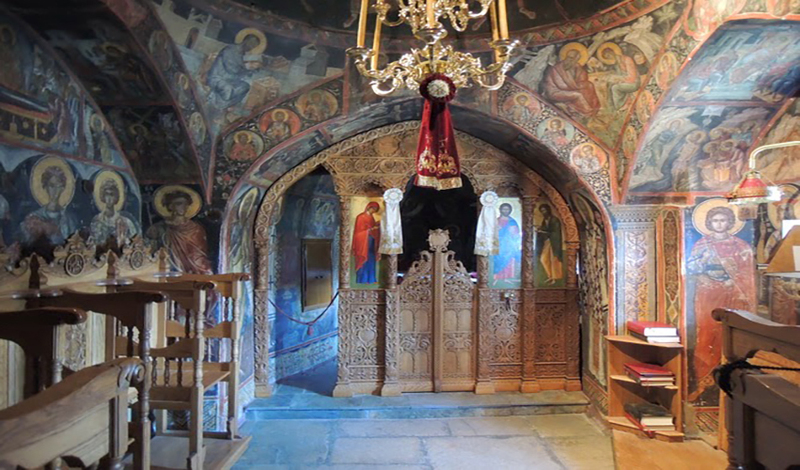 The monastery was totally renovated during the first decade of the 16th century and the present katholikon (a church of St. Nicholaos) was erected from its foundations by the Metropolitan of Larisa St. Ioannis Eleimon (†28 Mar. 1510), who resided here and spent peacefully as a monk the last years of his life, and by the Exarch of Stagoi Nikanor. The katholikon of the monastery is a small almost square church but uneven and irregular because of the narrowness of the rock. It has a small dome in the center of the roof which is dark without any windows, since another storey had to be built right above. An esonarthex (lite) precedes the nave, ample enough compared with the narrow nave.